G4J Connect:Glasgow – The debrief! 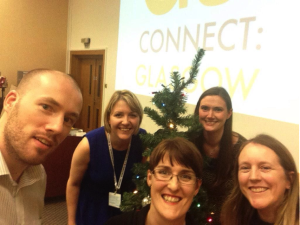 On the 1st December 2014 the first G4J:Connect event was held in Glasgow. Despite being a cold and miserable Monday night, the atmosphere was warm, appropriately festive and brimming with enthusiasm for training in Geriatric Medicine. Geriatrics for Juniors (G4J) was established in 2013 by the Association for Elderly Medicine (AEME) as an annual event to promote enthusiasm for and excellence in geriatric medicine training. Collaboration with like-minded groups has inspired local spin-off events across the UK. We started the ball rolling in Glasgow with G4J:Connect. It is already well known that specialist trainee recruitment in many of the medical sub-specialties is in crisis; in Geriatric Medicine, as the largest specialty, we are feeling this effect more than most. Access to formal education opportunities in geriatric medicine for undergraduate, foundation and core trainees is often variable and many junior doctors are unaware of what the specialty has to offer. We hoped that the G4J: Connect event could capitalise on the success of the national G4J meeting and address these issues by providing an evening of education; planned by trainees…for trainees, here in Scotland. If everyone left with a little more knowledge about how to care for frail and elderly patients in any health care setting we considered that a victory. If we managed to encourage some trainees to consider a career in geriatric medicine that would be an added bonus. The night was a great success with over 50 enthusiastic junior doctors turning out; from undergraduates to core medical trainees. Individuals travelled from Stirling, Edinburgh, Ayrshire and across Glasgow to listen to our excellent speakers who generously gave their time and support. Professor Paul Knight and Dr Jenny Burns both spoke on behalf of the BGS, Dr Graham Ellis spoke about geriatric medicine at the front door, Dr Claire Copeland spoke about delirium and Dr Rowan Wallace spoke about Parkinson’s Disease. A group of current senior registrars in geriatric medicine hosted a panel discussion to answer questions about training and help allay fears about the role of medical registrar; which is a significant barrier to recruitment. The feedback for all sessions was overwhelmingly positive. Social Media was a key factor in the success of the event. Our Facebook group gathered 200+ members within weeks of being established. The Twitter hashtag #G4JGlasgow was active in the weeks running up to the event and on the night. We had financial support from a number of sources including the Scottish BGS and OPAC (Health Improvement Scotland) and goodies from NHS Education for Scotland and OPAC to hand out to trainees as a reminder of the event. A striking message from delegates came in the feedback. Only 41% of delegates had undertaken any formal training in geriatric medicine as undergraduates and the majority said that they felt unprepared as a new FY1 to deal with the complexity they met looking after frail, older patients. Medical school is where we will have to start if the NHS is to meet the needs of the ageing population in every specialty. I think we achieved what we set out to do….planning for the next event will be underway soon and there is hope that similar events can be developed in other parts of Scotland in 2015.